According to the most recent UN estimates (United Nations 2017), almost one half of the world’s population lives in countries with below replacement fertility (BRF), i.e. with a total fertility rate (TFR) below 2.1 births per woman. Of these, one quarter have TFRs close to the replacement level, i.e. between 1.8 and 2.1; the other three-quarters have really low fertility, below 1.8 births per woman. 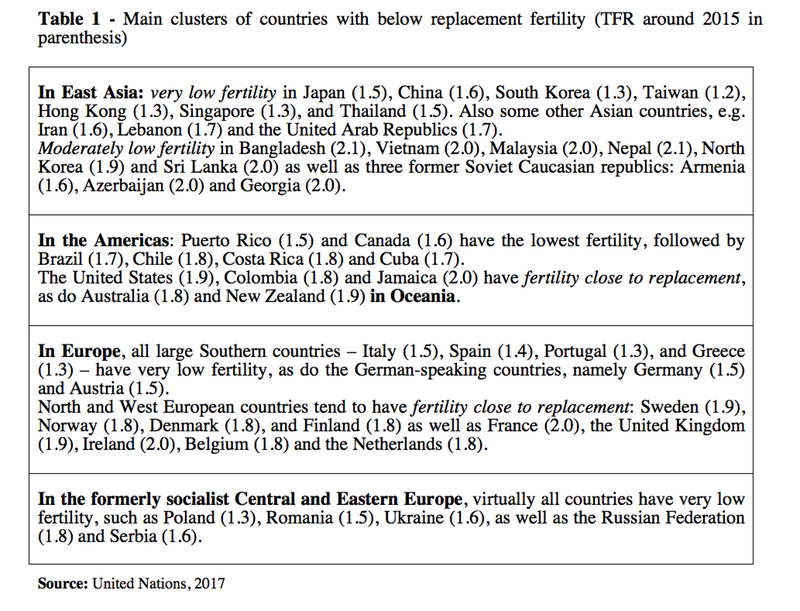 Low-fertility countries are generally grouped into clusters. The main clusters are in East Asia, Southern Europe, the German-speaking countries of Western Europe, and all the former socialist countries of Central and Eastern Europe (Table 1). In fact, contemporary fertility around the globe is lower than it has ever been. Since the middle of the 20th century, childbearing has declined by 50 percent: 50 to 60 years ago women in developed and developing countries combined had on average 5 children, but now the world average is about 2.5 children per woman. Why do so many countries have below replacement fertility? The new ideal of the small family arose typically in the urban industrial society. It is impossible to be precise about the various causal factors, but apparently many were important. Urban life stripped the family of many functions in production, consumption, recreation, and education. In factory employment the individual stood on his own accomplishments. The new mobility of young people and the anonymity of city life reduced the pressures toward traditional behaviour exerted by the family and community. In a period of rapidly developing technology new skills were needed, and new opportunities for individual advancement arose. Education and a rational point of view became increasingly important. As a consequence the cost of child-rearing grew and the possibilities for economic contributions by children declined. Falling death rates at once increased the size of the family to be supported and lowered the inducements to have many births. Women, moreover, found new independence from household obligations and new economic roles less compatible with child-rearing (Notestein 1953:17). Since then, fertility trends and levels, and their causes and consequences have been the most researched topics in population studies. However, despite the hundreds of published studies, it appears that Notestein’s observation continues to be valid: “it is impossible to be precise about the various causal factors, but apparently many were important”. In addition to never-ending advances in technology, the continuous need for new skills, the indispensable need for education, the persisting rise in costs of childrearing, continued mortality decline, and the steady rise in women’s status, important causal factors generating contemporary BRF since around the 1960s appear to be weakening economic and social conditions for large swaths of the population. These include often imperfect social and family policy measures; the improving quality, variety, and access to means of birth regulation; and the gender revolution (Frejka 2017). In the West – consisting of Western, Southern and German-speaking Europe, North America and Japan, as well as other East and South-East Asian countries – economic and social conditions are not as favorable as in the post-Second World War period. Various beneficial aspects of the “welfare state” have been whittled away. The level of real income has been stagnating, and income inequality increasing. Employment levels have been fluctuating. Unemployment among young people has been relatively high and employment insecurity is widespread. The cost of housing has been increasing, making it difficult for young people to secure decent homes. 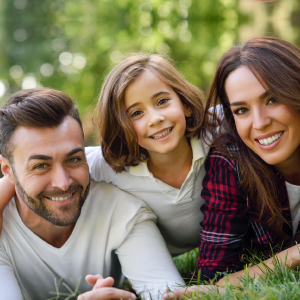 All of these conditions have contributed to the fact that young people are short on means and have postponed marriage and childbearing (Cherlin 2014, Hobcraft & Kiernan 1996). On the cusp of the 1990s, formerly socialist Central and East European countries experienced a fundamental transformation from paternalistic conditions of relatively secure employment, low-cost housing, free education, free health care and various family entitlements to the economic and social conditions of contemporary capitalism just described above. The concomitant decrease in fertility and family size comes as no surprise (Frejka and Gietel-Basten 2016). In China, the strictly enforced one-child policy on top of extraordinarily rapid industrialization and urbanization was instrumental in lowering childbearing. In all these countries, women have entered paid employment in vast numbers, especially since the 1950s, shouldering not only household chores, childbearing and childrearing, but also securing a significant part of family income. Often the needs of the family and work collide, taking a toll on childbearing. Men have started to contribute to household chores and childrearing, but only in part and at a slower pace than women entering the “public sphere.” As a whole, these developments constitute what is known as the gender revolution (Frejka et al. 2017). The improved availability of a widening range of contraceptive means – often labeled as the contraceptive revolution – and the gradual legalization of induced abortions in many countries along with safer methods of performing abortions have made it easier for people to achieve whatever their desired family size might be. Knowledge about the demographic consequences of fertility trends is among the most important basic ingredients for long-term and short-term policy making and planning. Nowadays fertility and its effects can be projected reasonably well for the near future of 10-15 years, but also over longer periods, for which a set of alternative projections can be calculated. Such information is indispensable for planning and costing educational institutions, health care systems and social security systems, for example. It also serves to determine the availability of human resources for the labor market or for military purposes, or to calculate immigration and emigration probabilities. Let us take the example of Japan which is a relatively closed population without much migration, in or out. Fertility declined to below replacement in the late 1970s, and is currently at about 1.4 births per woman. 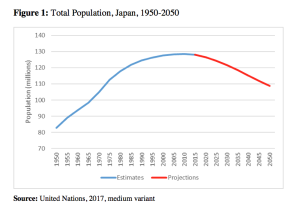 Because of population momentum, the Japanese population was still growing until around 2010, but it started to shrink thereafter and is likely to continue to do so for decades (Figure 1). Changes in Japan’s age structure are depicted in Figure 2 and Table 2 for the years between 1950 and 2050. In 1950 the majority of the population was young, and only 5 percent was 65 years old and over. By 2015 a full one quarter was aged 65 and over, and by 2050 the proportion will likely rise to 36 percent. The social and economic costs of such an abrupt change in such a historically short time are difficult to evaluate: its impact on the pension and health system, family structures, labor productivity, etc. is enormous. Japan, followed by many other countries, is heading towards a path never experienced in human history, and that appears to be full of unknowns. Some may consider below replacement fertility and the ensuing population decline as a positive development because it may lead to a reduced need for, and to actual lower consumption of resources, such as food, fuels, and housing (Grossman, 2017). 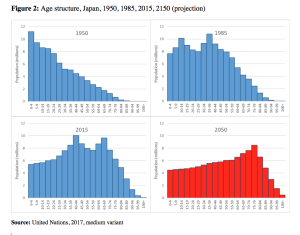 However, population decline is necessarily accompanied by profound changes in the age structure, and by a considerable increase in the share of old people that, too, has its costs. 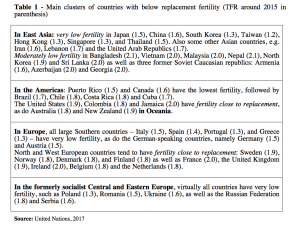 The general world trend is for a continued fertility decline and for an increasing share of countries joining those with below replacement fertility. When this decline is fast, profound or prolonged, the consequences may be difficult to handle. But this destiny is not unavoidable: a few countries, especially in Northern Europe, which also experienced a fertility decline, have been successful in maintaining levels close to replacement. So the good news is that declining fertility may be stopped before it gets too low or may even be reversed. How that can be done, however, may require another article in N-IUSSP. Cherlin, Andrew J. 2014. Labor’s Love lost: The Rise and Fall of the Working-Class Family in America. The Russell Sage Foundation. Frejka, Tomas. 2017. “The fertility transition revisited: A cohort perspective,” Comparative Population Studies, 42:89-116. Frejka, Tomas and Stuart Gietel-Basten. 2016. “Fertility and Family Policies in Central and Eastern Europe after 1990.” Comparative Population Studies. 41 (1): 3-56. Hobcraft, John and Kathleen Kiernan. 1995. “Becoming a parent in Europe.” In: European Population Conference 1995. Evolution or Revolution in European Population. Vol. 1. Plenary Sessions. Milano. 27-65. Notestein, Frank W. 1945. “Population – The Long View.” in Schultz, Theodore W. ed. 1945. Food for the World. 36-57. Notestein, Frank W. 1953. “Economic Problems of Population Change.” In Proceedings of the Eighth International Conference of Agricultural Economists. New York. 13-31. United Nations. 2017. 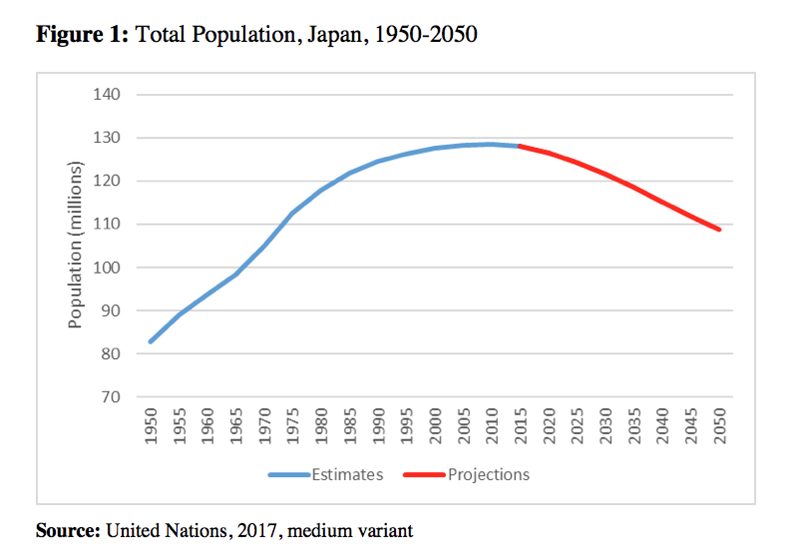 World Population Prospects: The 2017 Revision, Key Findings and Advance Tables. ESA/P/WP/248.